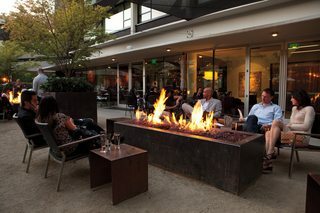 I've been noticing gas-fueled flame pit displays outside some "hip" restaurants, such as this one shown in a Portland Monthly article. I find myself reacting to them with disgust; it looks like they're blowing fossil carbon into the sky like there's literally no tomorrow. The one in the linked article at least has people sitting around it; sometimes they're just alone out front, advertising the owner's environmental folly. However, I don't know how much CO2 such a display actually emits. Our environmental instincts aren't very accurate, and I fear that I may be getting huffy about these minor displays while blindly causing far more emissions elsewhere in my life. For a baseline, use three of this Uptown Fire Pit Tables. It has a 12" x 42" burner (powered by a 20 pound propane tank in the base), and claims to produce up to 88,000 BTUs, although I'll assume they mean 88,000 BTU/hour. So, the baseline would be a 12" x 10' burner emitting 264,000 BTUs/hour. Taking this video as a reference (https://www.youtube.com/watch?v=VYZKGlxutfw), a 20 lb (I take that as 10 kg) tank as in your burner lasts for 6 to 12 hours. So roughly 1 kg per hour. Assuming pure propane, which has 36 g/mol C and 8 g/mol H, every kg of propane contains 36/44 kg carbon. Under complete combustion this leads to 3 kg CO2, so that is your hourly C)2 emission. For comparison: Manufacturers of cars report something around 100 g/km (e.g. for a Mercedes C-Class) as CO2 emission. That value is of course highly optimistic. But if we assume these values, you need to drive roughly 30 km in order to emit 3 kg of CO2. 4.9 kg of carbon forms 4.9 x 44 / 12 = 18 kg of CO2 emitted by the fire pit per hour. My car emits 16.6 kg of CO2 per 100 km at highway speeds. So, that fire pit emits about what my car emits at highway speeds, constantly. On its own that isn't apocalyptic, but I still find it pretty irritating. Not the answer you're looking for? Browse other questions tagged heating greenhouse-gas-emissions or ask your own question.